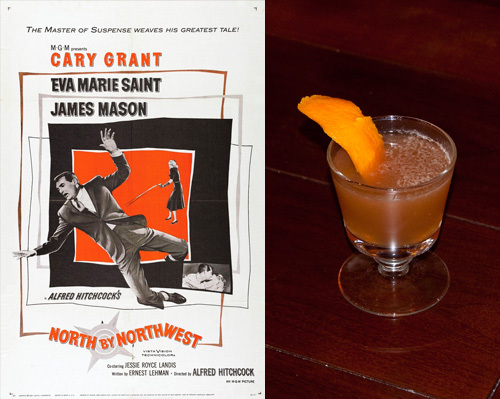 North by Northwest was a hard one for me that produced a lot of failed attempts, but one that finally stuck was a riff on the Blood and Sand. I substituted Bourbon (what they drug Roger with) for the Scotch (what he drinks by choice) into a cocktail of mistaken identity. Shake with ice. Strain into old fashioned glass over rocks. Garnish with an orange twist. I played with the proportions a bit and substituted Averell, a liqueur of Damson plums, for the Cherry Heering, which always tastes like cough syrup to me. I pulled the bitters out as well as I felt they weren’t needed in the final concoction. Yummy, and nary a cropduster in sight.